British troops fired 46 million rounds of ammunition at the Taliban during eight years of combat in Afghanistan. The bullets and artillery shells used cost the taxpayer a total of nearly £200 million ($300 million). During a six-month tour of Helmand Province, where the most brutal fighting took place, 55,000 bullets from 30mm cannons were fired from Apache helicopters – with just a few seconds of fire destroying a single Taliban bolt hole. As each bullet cost £65 ($100), a single deployment cost £3.58 million ($5.35 million). During close-up fights between soldiers and Taliban militants, 2 million rounds were fired from 9mm handguns. “That so many 9mm rounds were used shows how close fighting was at times,” Craft said. UK troops were firing on average 10,000 bullets every day from their SA-80 assault rifles and Minimi light machine guns. Each bullet cost 50 pence (75 cents), which means a soldier fired at least £5,000 ($7,500) per day from those weapons. The figures were revealed following a Freedom of Information (FoI) request made by the Daily Mirror regarding the Afghan conflict. UK soldiers engaged in a military campaign in Afghanistan in 2001 to join the American-led offensive following the 9/11 attacks. During the British military’s 13-year involvement in Afghanistan, 453 UK military personnel were killed. 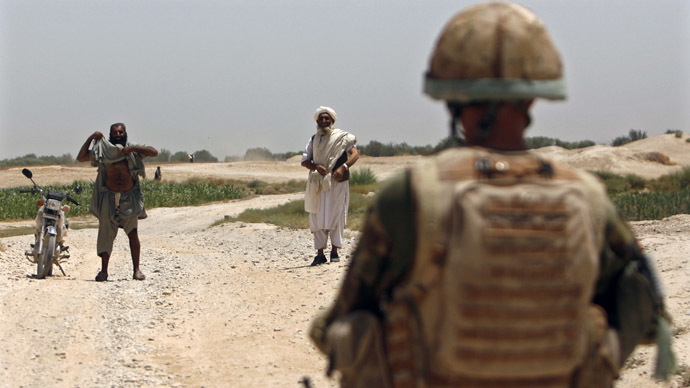 Foreign combat operations in Afghanistan ended late last year, with British forces handing over their last bases in Helmand to the Afghan military in October 2014.